The comic was so wordy earlier that we just decided to get rid of the words altogether. Also, it’s my birthday today! Hey it’s Victor’s birthday. Wish him happy birthday because without him this comic would just be an idea in the back of my head that might MAYBE have gotten turned into a book I would have tried to take way too seriously, but most likely would have just died there. Also I love him. PS I kind of had to hurry on this last night because of the birthday thing and all so I might go make a few minor edits later, like more exciting backgrounds. We’ll see. cmon, ik skarva just isnt trying because himself is the “last” boss. He’s trying. At the same time he has a sort of fatalistic acceptance already; Skärva is powerful but he’s smarter than he is tough, and as all his carefully-laid plans and weeks of preparation were foiled in a matter of hours, he’s already taken a devastating blow. Also fight scenes are hard to draw, man. and happy birthday Victor! Where would I be without you? Well a) what is Lorelei going to do, really and b) Derk is still having a moment. PFFFFFT you think this comic keeps YOU from doing homework. Lols. Hehehehe but it’s worth it. I was figuring Derk and Skarva would be fighting while Lorelei healed anyone who was injured. …or does that kind of tactic not work for villains? Courtney and Victor present: EXPLANATIONS! Courtney: Well you see, Lorelei can only heal people by touching them and Derk is not about to let her run around in the fray. In addition, Derk knows this is Skärva’s time; it’s custom for him to try to prove himself alone, one-on-one against a hero, like his father. Neither of them has an easy time cowering there and watching all this happen but it’s how the battle must progress according to this sort of code of honor which, ironically, the highest villain in Idenau is under more pressure than anyone to maintain. Also, where would I be without Victor? Sad, that’s where. Sadville, USA. the cape!?! not the CAPE!!!!!!! As to the comic, I’m very fond of the fourth (appropriately enough :P) panel ((*steals someone else’s ‘ä’) Skärva dodging Blank’s lunge) – the flat colours place the emphasis on the motions, and the silhouettes are lovely and fluid. Personally, I’m not sure about including the panel after that – it seems to me to slightly break the sense of quick action; I’m not sure of what to suggest offhand, however – perhaps another action, also in silhouette, such as Blank recovering while Skärva charges his magical attack? Well I’ll make SURE it’s an awesome year for him. Thanks for the advice, again. 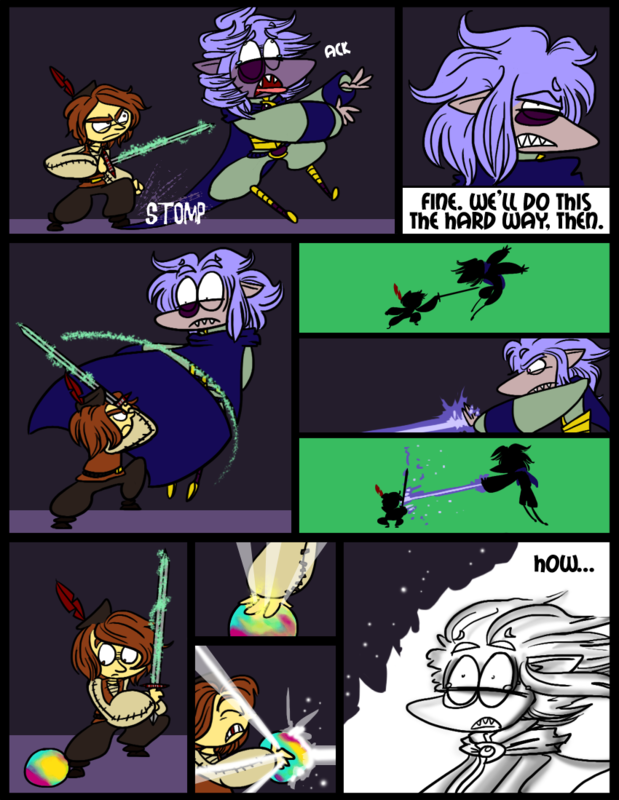 I’m not sure that I’ll change it now the comic’s already up, but then again I wouldn’t mind making some alterations to this particular page because I had to rush it somewhat, due to Victor’s birthday rushing up towards me and all. Ïnternätionäl këyboard is ñecessary for ä lïnguistics mäjor like me! It makes ümlauts ëasy! If I was a stickler, I would point out that if you can’t use umlauts, you should add an e, therefore Skärva = Skaerva, but I don’t want to drive people away by being annoying and even Victor pronounces his name wrong most of the time so what are you going to do. I promise I didn’t insist on him having umlauts in his name (Victor thought we should be rid of them at the outset because they are kind of a bother) just because I thought they were cool and *exotic* but because it’s an actual word in Swedish, and skarva means something as well but a lot lamer. Skärva means “shard.” Something that is sharp, jagged, dangerous, fragmented, broken, something that people generally try to avoid. Skarva means “to join.” Which is better? I really like your choice of name; I don’t think that I’d thought to look it up. As to umlauts, if I had a keyboard capable of producing them conveniently, then I would have no excuse to steal them, which is the more villainous thing to do, after all. I’ll always see them. We get alerts about new comments, so don’t worry about posting on “old” comics. Victor’s choice of name! Tiberius Skärva IV was all him, and it’s perfect perfect perfect. I’m not very good at thinking up names usually, although Derk and Lorelei were mine. To the first: ah, excellent! To the second: I like Derk and Lorelei’s names too, for that matter (although I’ll confess to having a particular liking for Skärva’s). They have stories behind them, too. Sort of. My little brother and his best friend from high school (who has become pretty much adopted into my family) have this lexicon of slang all their own, and “derk!” is what they would shout out or mutter whenever someone does something silly or stupid. It’s like derp, but they had to make it their own I guess. And Derk isn’t very bright and he’s pretty clumsy, but his loyalty and friendship that make him inseparable to Skärva remind me of what my brother and his friend have going. Lorelei is simply my favorite girls’ name and I always wanted to name my daughter that if I had one. Ok, that’s not much of a story. ….We got Lomurcio by me randomly pounding my hands onto the keyboard until we got something that seemed like a name. It’s actually a very good sage’s name, isn’t it? Too bad Edna Mode doesn’t work with villains. Or does she? Yeah, I don’t know how he supports himself with those things, let alone his li’l feets. Luckily the rest of him is also absurdly skinny.